Glen Millar with the sponsors, Hobson Electronics. ‘ Father and Son team, Mark and Kyle Thompson from Irvinestown, are back out again on the Moonraker in their nicely-prepared Mazda MX5. Entries have now closed for the Dungannon Motor Club Ltd., Clubman’s permit, Navigation Rally with special tests on Friday 21st September 2018, starting from, and finishing at, Davidson’s Bar in Castlecaulfield. The event will contain regularity sections on public roads, timed to an accuracy of one minute and will also contain special tests timed to the accuracy of one second. The full regulations are still available on the “Pre-Event Documentation” panel, as are the FINAL INSTRUCTIONS. 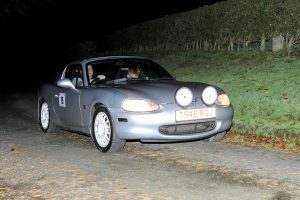 Competitors are especially reminded that cars fitted with LED light bars will not pass scrutiny. The final, seeded entry list can be viewed here ===> SEEDED ENTRY LIST.